The S’Park mixed-use development planned for Boulder Junction is one of the few developments in Boulder big enough to make use of Low Income Housing Tax Credit financing for on-site affordable housing units, the author writes. Recent letters have questioned Boulder’s policy of allowing housing developers to pay “cash in lieu” of providing permanently affordable housing on site. There’s a suspicion that since the cash-out option is often more attractive to developers, it must be worse for the city and our affordable housing program. This isn’t true, but I can’t blame the public for wondering. When developers pay cash-in-lieu, the money goes into the city’s affordable housing fund, which can be used only for affordable housing, not general expenses. Grants are made to non-profit affordable housing developers like Thistle Communities, Habitat for Humanity, and the Boulder Housing Coalition, as well as Boulder Housing Partners (BHP: the city’s housing authority). Grants are used as equity stakes in new affordable housing projects. Local funding demonstrates the local support needed to unlock state and federal housing funds. By bringing in outside money and leveraging the local cash-in-lieu, non-profit developers can often create far more affordable housing than if private developers were to provide it on-site. In the memo BHP sent to City Council in advance of its January retreat, the housing authority estimated a required city investment of $60,000 per new affordable unit created. Private developers pay twice that, about $120,000, per affordable unit owed to the city under our inclusionary housing policy. The difference between 20 affordable units on-site and 40 off-site is enormous. We need a lot of affordable housing in Boulder, so building it as cost effectively as possible is important. Private developers can also access federal affordable housing funding, including Low Income Housing Tax Credit (LIHTC) financing, but there’s significant overhead involved. Often, LIHTC financing is only worthwhile if you’re doing 30-40 affordable units. Boulder’s 20 percent inclusionary housing requirement thus necessitates a market-rate development of 150-200 units for an on-site LIHTC deal to make sense. 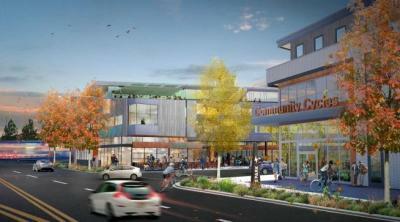 Sometimes this works out: the S’Park project in Boulder Junction will include on-site LIHTC financed units. It has the required scale, and the developer (Element Properties) knows how to work with tax credit investors. But especially when housing is being built in smaller batches, by smaller developers, it’s preferable for builders to pay into the affordable housing pot, and let the non-profit sector specialize in creating affordable housing. Doing affordable housing on-site is also complicated by the fact that rent control is illegal in Colorado. When housing is owned by a non-profit, we can make permanent affordability a condition of accepting grant funds. Allowing non-profits to take the lead in building, owning, and managing affordable housing also builds organizational capacity. The equity that accrues in those properties, and the cash flow that they generate, allows these local, mission-driven organizations to grow, remain autonomous, and employ people who do this work because they believe in it, not because it’s a required part of the profit-motivated enterprise. There are many social benefits to creating mixed-income neighborhoods, and we should prioritize doing so. Both on-site and off-site affordable housing can serve this goal. We should also ensure that more of our affordable housing is centrally located, giving residents easy access to jobs, services, and the full menu of transportation options, which can lower their overall cost of living, and help minimize the traffic impacts of adding new housing within the city. We need to find cost-effective ways to meet all these goals simultaneously. This could mean changes in how we treat land tenure — holding some land in the public trust, and attaching affordability requirements to the housing that is built on top of it. We should consider upzoning in appropriate areas, contingent upon permanent affordability — paying for affordable housing with zoning rather than cash. We should also get out of our own way when it comes to building market-rate affordable units — land use regulations that limit the number of dwelling units per acre encourage the construction of a small number of large, expensive units, rather than a large number of small, inexpensive units. Demanding that all affordable housing be provided on-site will just result in less affordable housing getting built. Some in our community have even suggested that we should be using precious affordable housing dollars to help lower income folks buy into existing single family homes. It’s hard to imagine a less efficient way to use our limited resources. Arguing that we should be using our affordable housing dollars inefficiently is the same as arguing that we should build less affordable housing, and that’s certainly not what Boulder needs right now. Lincoln Miller is executive director of the Boulder Housing Coalition.